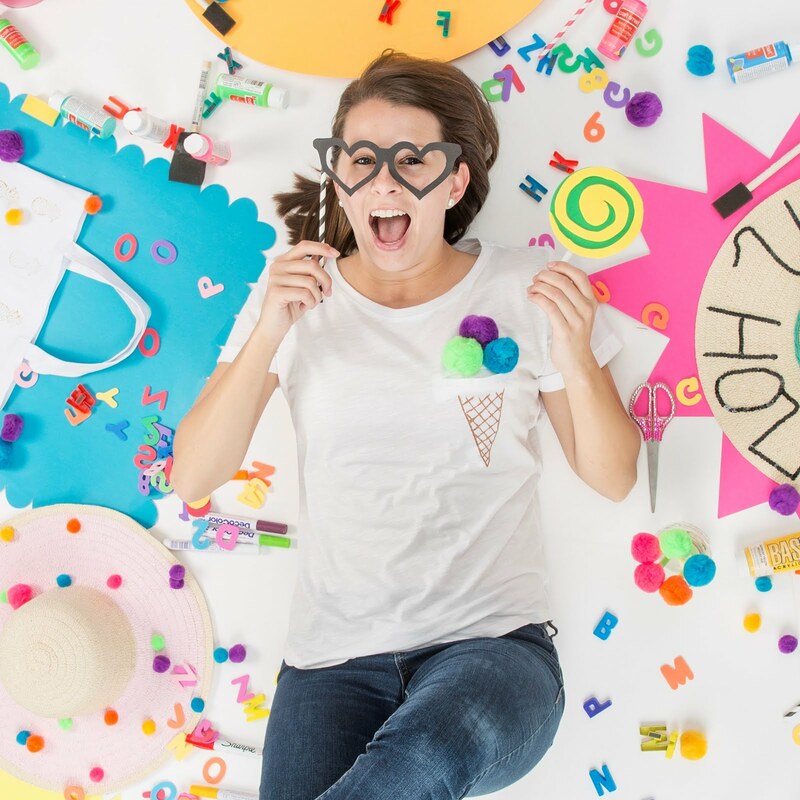 If you've been following along with me for a while, you know how much I enjoy planning theme parties, but I'm especially excited to share today's blog party post! My BFF is getting married in less than two months and all of our besties got together last weekend to celebrate her last few weeks as a single gal! The second she got engaged, her Maid of Honor and I got started on planning the perfect cabin weekend. Our mutual BFF, Aly, has loved the winter Olympics since anyone can remember, and thus the Winter Alympics were born! Other than food and drinks, I personally think decor is the most important category for any party! We really wanted to set the tone for the weekend right when the guests walked through the front door. We used jumbo sized letter balloons from Anagram Balloons to make a big statement. 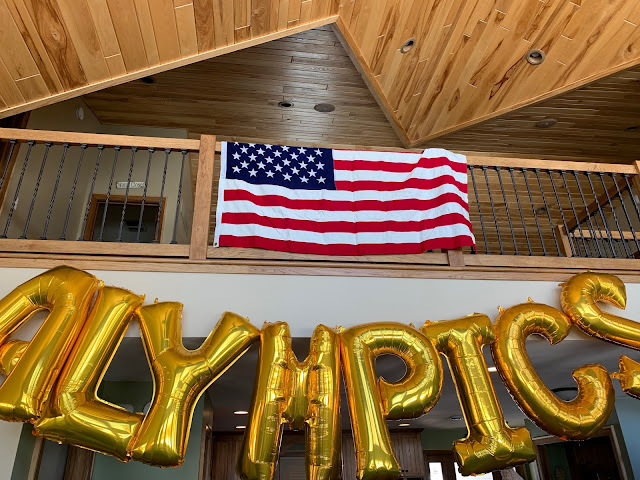 We spelled out Alympics with gold letter balloons (found HERE) and hung them from the loft! These were such a hit and made the perfect photo backdrop! I had my letter board from Felt Good Vibes to out when the gals walked in! More on this below but we also had a table set up under the balloons with all of the party swag for the guests! As soon as we decided on the theme, I made a logo to use on all of our emails, itineraries, etc. 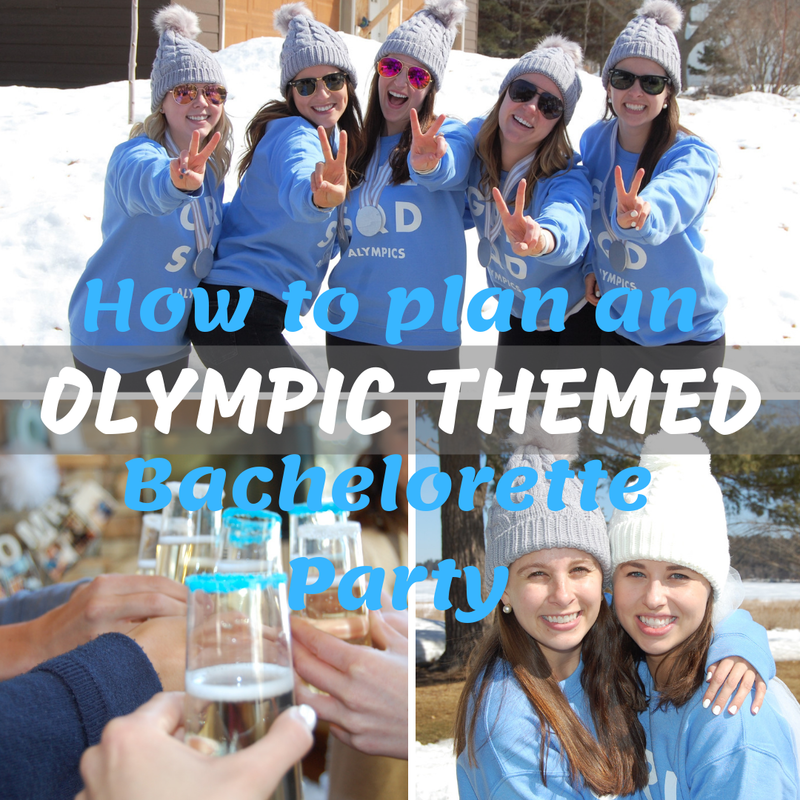 Feel free to save the pic and use it if you host an Olympic themed bachelorette party! The MOH went to Costco the morning of the party and picked up a fair amount of pizzas, chips and dips, Prosecco, Trulys, and many more yummy items. My contribution to this category was our welcome drinks!! I added sugar to the rims of these plastic champagne glasses (would highly recommend). I found the instructions for the colored sugar here! I poured granulated sugar into a bowl, covered the rim of the champagne flutes with lemon, and swirled the top of each glass in the sugar. Since guests were arriving at various times on Friday night, we just made a few pizzas and had a relaxing spa night! Saturday was our big day of Alympics! Morning Workout - I was so excited to lead a workout! I love going to the gym but have never taught any kind of class, so this was all new to me. We refer to the bride as our athletic friend (lol) so we knew she would want to start the day with a workout! I put together a list of some moves - mountain climbers, squats, lunges, and ended with partner sit ups! 10 sit ups with a high five after each one! Music linked here! Opening Ceremony - This was the perfect way to kick off the afternoon games. We hung up an American flag on the loft and listened to the Star Spangled Banner. While the MOH explained the games, we played the Olympics Fanfare and Theme song over the speakers to get everyone pumped up! 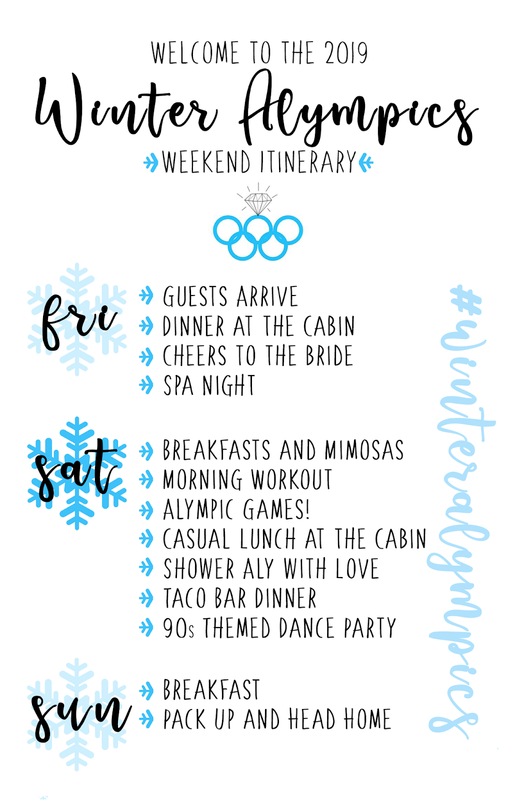 Alympic Games - There are SO many bachelorette or Olympic style games but I recommend choosing some that require little to no setup so that the games flow nicely. Since the party was in March, we planned our games assuming there would be snow on the ground. There were 11 of us so we chose 2 teams of 5 and a referee/judge! We had a snowman building contest, a race to drink (run 15 yards through snow to a table of drinks), and a few other bachelorette party games. Music - One of the bridesmaids put together the perfect playlist for the weekend! She had party music for Friday night, soothing music for the morning, pump up music for game day, and tons of 90s music mixed in! Welcome Swag - One of my fav parts of walking into any bachelorette party is seeing all of the swag!! We gave each gal a sweatshirt, a stocking cap (white for the bride), a hangover kit (filled with Advil, mints, band aids, chapstick, etc), as well as a water bottle with a personalized label and an itinerary - both printables made by PaigeSkeieDesigns! I hope you enjoyed reading all about the party! This was such a fun theme and I highly recommend planning your own Olympics party, just for fun!